Ekstase - von allen Menschen ersehnt und in diesen Aufnahmen von 1979 musikalisch demonstriert. The recent surge of interest in world music has brought to light the important contributions of German multi-instrumentalist, Deuter. In the 1970s, this innovative artist helped to set the tone for a warm, highly accessible approach to music from other cultures. Few albums illustrate this more profoundly than Deuter's 1979 release, Ecstasy. 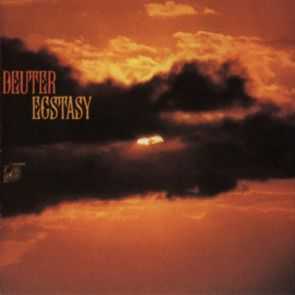 Ecstasy is one of several pivotal albums that Deuter recorded as a result of his studies in India during the mid 1970s. There he took up residence in an ashram, probing deeply into Indian music, and completed many compositions that he had begun in Germany. In mixing Eastern and Western textures with engaging, uplifting melodies, Deuter found an appropriate balance for his spiritual ideals. With soaring flutes, rich synthesizer textures, resonant guitars, spiraling sequencer patterns, and delicate percussion, he created a sense of exhilaration and joy matched by few artists. The music on Ecstasy truly lives up to its name. For over two decades, Deuter, has offered listeners a gateway to a new musical experience, one that incorporates lightness of spirit, depth of vision, and an innovative blend of acoustic and electronic sounds. Born in Falkenhagen, Germany in 1945, Deuter taught himself to play the flute and guitar. Following high school, he moved to Munich, and worked as a graphic designer and newspaper columnist. During the 1960s, Deuter began to question conventional values. Searching for answers, he joined the Sufis and studied with a follower of Gurdjieff. In 1970, the trauma of a near fatal auto accident sparked a dramatic and irrevocable transformation; music and a personal spiritual search became Deuter's lifeblood. His first recording, D (11009-2), was released in 1971 on the Kuckuck Schallplatten label. Extended travels throughout India and the Middle East infused subsequent recordings with a unique cross-cultural perspective. Deuter continues to compose and record. His association with Celestial Harmonies has produced thirteen recordings on the Kuckuck label and a video, The Petrified Forest (19001), on the affiliated MonteVideo label. 1 Wings of Love 7'00"
4 Blue Waves Gold 3'40"
5 Back to a Planet 7'00"
7 La Ilaha Il Allah 4'56"